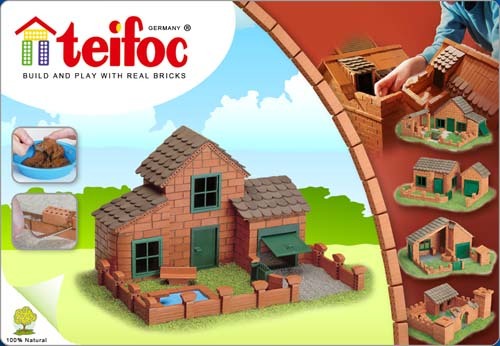 If you’ve got a budding mason in your family, or if you’re looking for a gift that is far from run-of-the-mill, you’ve got to check out the Teifoc building sets. While Legos might rule the roost as far as popularity is concerned, Teifoc sets from Germany give you a much more immersive experience. It’s really a very simple concept: brick and mortar, in miniature size. Recommended for the 8+ crowd, it does take some getting used to. There are no easy short-cuts to make the beautiful castles and houses pictured on the boxes. It’s a process, more than anything, made of earth-friendly materials and designed with long-term play in mind. What I mean is that it’s not a simple sit-down and create kind of toy. It takes time and concentration to get a good result. It’s not just learning about building; the Teifoc sets are a great springboard for learning about physics. Someday, if I had the time, I’d love to try my hand at a freestyle cathedral — though I’m not sure I could quite manage Gothic style. Anyway, as we learned here at home, the effort is definitely worth it. If you and your kids enjoy the challenge of creating truly remarkable little structures, and want to put the time into it, I can’t suggest Teifoc enough. If, however, you’re not in it for the long-haul and you’d rather just cut to the chase, well, this isn’t exactly for you. The contents of the box are simple: bricks, specialty building pieces (like windows and doors and roof tiles), a mini trowel, and mortar. My favorite part about Teifoc is that after building one structure, that isn’t the end. Soaking the bricks in water dissolves the mortar. So everything is totally reusable! ← Twelve Bots of Christmas: Day 10!